Dock for loading motorcycles. 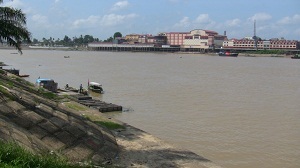 This dock is located on the north side of the Batanghari River in the City of Jambi. It is the same location where we shot the below video. To go to the other side of the Batanghari River at the City of Jambi, an inexpensive taxi boat (ketek) can be obtained for Rp2,000 ($0.25 US). 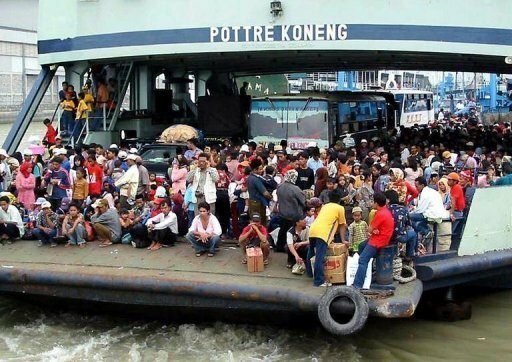 On September 28, 2011, eight people died on an overloaded ferry, before it departed to the island of Kalimantan, from the island of Java. The cause of the 8 deaths, and many injuries, was due to a stampede that occurred when a fire broke out. Ferries are a major form of transportation between the many islands of Indonesia. 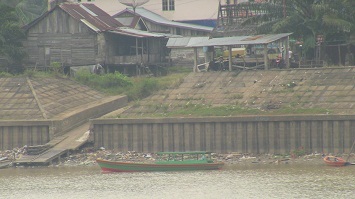 Many of these ferries are overloaded with passengers and have few have sufficient life-jackets and safety equipment. It is not uncommon to hear of these ferries catching on fire or sinking, with the loss of lives.